Beautiful ground floor in Denia. The property is distributed in two bedrooms and two bathrooms, a kitchen and a very bright living room from whit access to the terrace and the garden with direct access to public areas and pools. Close to the beach (750m) this urbanization has large common areas, landscaped and 24 h door keeper-security service. If you want to acquire a property close to all amenities, but quiet at the same time, please do not hesitate to contact us to view this great ground floor apartment we have for sale. Apartment on ground floor with garden. This apartment is in a very quiet area, but close to the town and the beach. Walking distance to supermarket, shops, tennis club, town sports area with new indoor pool and spa, gym... Parks, sand beach at 300 m. It is in a very well maintained urbanization, 10 year old. The apartment consists of a living room, individual kitchen, 2 bedrooms, 2 bathrooms, a terrace and private garden. Large communal areas, great for children, child and adult swimming pool, 24 hour door keeper. Fantastic for all year round or holidays. 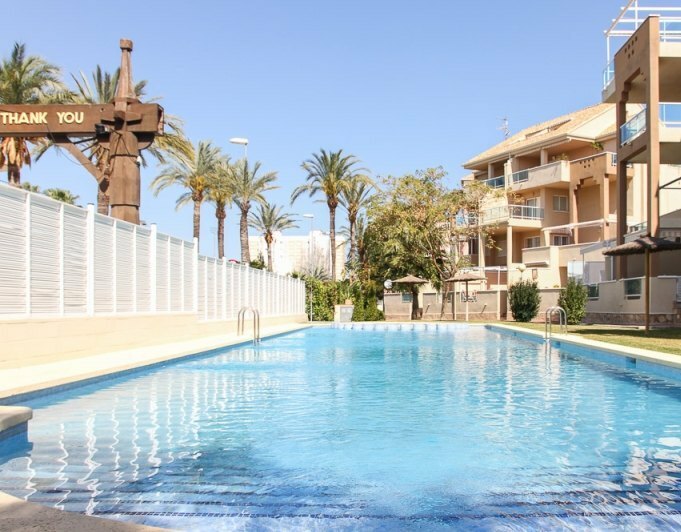 Don't miss the opportunity to purchase this beautiful apartment with open views, in a very consolidated complex, with communal pool and garden areas. The apartment, completely renovated with quality materials, has two bedrooms, a bathroom, a large living room from which access to the front terrace, where we have a staircase that leads up to the spectacular terrace covering the entire surface from the House. This little corner of the House has installed a shower and a barbecue that give the possibility to make a zone chill-out with stunning views that you will give the pleasure of enjoying a dinner or relaxing moments in a special and different way. 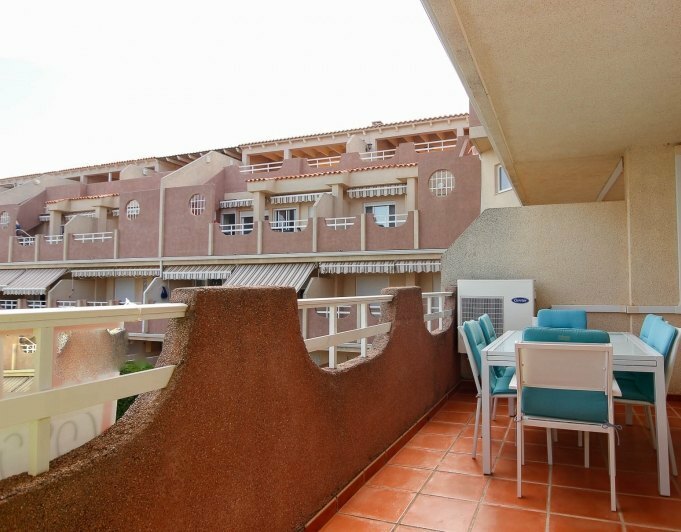 Nice two bedroom apartment in second line at the sandy beach of Deveses. Second floor facing Southeast with elevator. It consists of 68,14 m² distributed in entrance, equipped kitchen, living room, two bedrooms, toilet with shower and full bathroom. It has a good terrace 19 m² with open views to the sea and the mountains. Equipped with split air conditioning in dining room and bedrooms. Very well preserved and recently painted, ready to move in. The apartment is sold with a garage in the basement and storage room. The complex has spacious green areas, playground, swimming pool and tennis court. 200 metres from the Deveses beach. 2 bedrooms ground floor townhouse in a cozy urbanization with large garden and communal swimming pool, just 150 m. from the sandy beach.The apartment consists on 2 double bedrooms, 1 fully reformed bathroom with shower, kitchen, living and dinning room, laundry and a nice large sunny terrace with direct access to the garden.In an urbanization with communal garden, swimming poll and just 150 from the sandy beach and 3 kms. to Denia Town center with easy access with bus service. Spacious apartment in Denia, within walking distance of all services and amenities.Housing available with 3 doubles bedrooms, 2 bathrooms (one ensuite with Jacuzzi) large modern kitchen with laundry, living room and terrace. 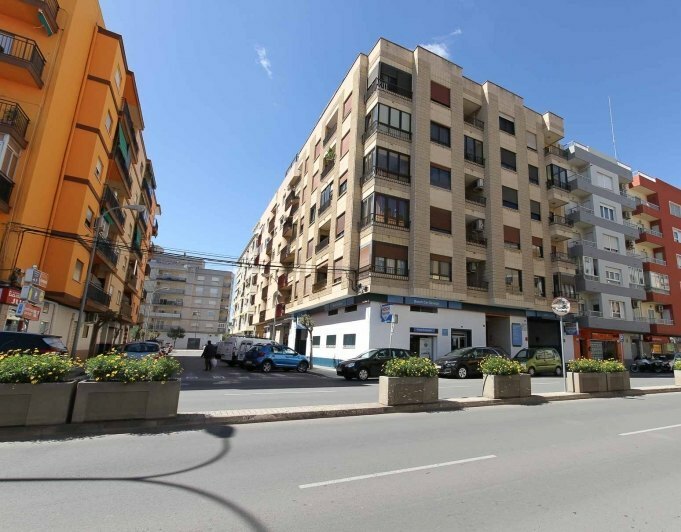 Very bright and good quality of construction.It is located on the fifth floor of a building with elevator.Underground parking and storage room included in the price.Within walking distance of the Centre, supermarket, restaurants, sports facilities and leisure areas.Approximately 1.5 km from the beach. This apartment was built in 1995 and is situated on a second floor with lift. There are two spacious bedrooms with built in wardrobes, two bathrooms, a dining and living room with an open kitchen. There is an enclosed storage room for the washing machine. The outside terrace is southfacing and overlooking the lovely complex with communal garden and pool. Shops, restaurants, bars, the pharmacy and the bus stop are all within 5 minutes by foot. Spacious apartment with plenty of natural light to just a few minutes walk from the Centre of Denia, close to all amenities.The property is completely renovated with materials of high quality and modern style. Perfect room distribution, fitted wardrobes, plenty of storage space, bathrooms with ventilation, air conditioning, wide entrance hall with fitted wardrobe, corner living/dining room with glazed terrace, allowing you to have a leisure corner, open views towards the Castle. It is comfortable for a large family, to live yearround or just enjoy the holidays, the distance to the beach 1 km.It has 4 bedrooms in total: master bedroom with large sun balcony and bathroom, further 3 double bedrooms, one with balcony, all with wardrobes, two bathrooms with shower.Fully equipped spacious kitchen with pantry.A great opportunity to live in the towncenter without the need of a car. 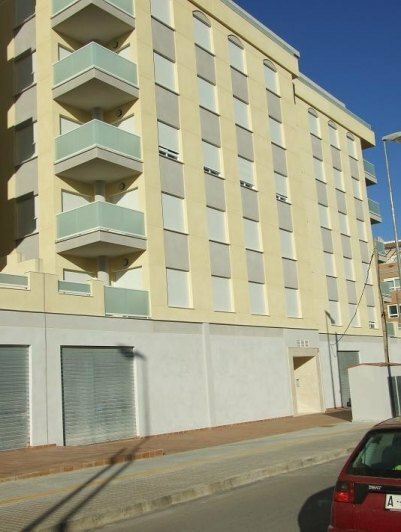 New apartments in Denia, 94 m2 built in 2 bedrooms, 2 bathrooms, living room with balcony and open kitchen. Building located in the town center with access to all services.These properties have two bedrooms with fitted wardrobes, one with exit to the terrace, two bathrooms (one en suitte) with high quality finishes, an ample living room with exit to the balcony, open kitchen furnished , Extractor fan, electric water heater and spectacular wardrobes, air conditioning ducts, reinforced door, exterior carpentry pvc / climalit double glass. The building has 2 or 4 bedroom duplex penthouses and 1 bedroom apartment. Apartment in Denia for sale in the sand beach first line. Vey well maintained apartment at 10 minute walking distance to bars and supermarke t, Nearest village Els Poblets, 4 km. Denia is 5 km away. Large swimmingpool, garden, tenis court, private parking included. Nice clean sany beach is 20 m from the garden. A great flat in the most popular resort of Denia. This flat on the ground floor high above the ground, together with garage and storage room. The advantage of this housing are 2 big patios on both sides of the property. One of them overlooking the communal pool and the other has a small garden with plants and shrubs. The apartment has an entrance hall, a kitchen, a large living room, 3 double bedrooms with fitted wardrobes and 2 bathrooms, one with shower and the other with bathtub. The House is sold as it is, in very good condition and basically furnished. The complex has a large swimming pool with jacuzzzi, wide garden areas, track of paddle, swings for small area, Concierge. The location is ideal: next to several schools, supermarkets, banks, House of culture, to the center of the city there are 7 minutes walk, basically it is at walking distance from everything. Beach 900 meters, 15 minutes walking. Apartment on the beach in Denia first line.Apartment in Denia Beach, in front of the sea. Semi new and well maintained, with 2 bedrooms and 2 bathrooms, living room and kitchen, as well as a large terrace of 15 m 2 each. Very nice and in estate cared for gardens and communal pool. It is located at km 4.5 of the marinas, near services open all year as supermarket, pharmacy, etc. also stop bus to Denia one step.Ideal for holidays or as an investment to rent but also for living all year round if you want to be close to the sea. Immaculate apartment on the ground floor with ample terrace and direct access to the garden, ideal for lovely holiday on the beach of Las Marinas, located 100 metres from the sea and 4 km from the towncenter. 80 m2 of constructed surface with 2 bedrooms, 2 bathrooms, livingdining room, and closed kitchen. The residential complex has extensive gardens and a large communal swimming pool. A parking space in also included in the price. Close to all amenities (supermarket, pharmacy, restaurants, bars, bus stop, etc). A great opportunity to acquire your holiday home in Denia. Very well located apartment, only a few metres from a beautiful sandy beach, restaurants, supermarkets, pharmacy, bus stop. Nice terrace overlooking the garden and the pool. Residential complex with concierge service. It has 2 double bedrooms with builtin wardrobes, livingdining room, kitchen, 2 bathrooms, covered terrace. Equipped with marble floors, PVC Windows with double glazing, hot/cold air conditioning. The price includes an underground parking space and storeroom. Sold completely furnished. Very well kept residential complex with concierge service. Ground floor apartment with large terrace from which you can access the common areas of this small development with communal pool and located near the beach.With 2 double bedrooms and 2 bathrooms, living room with access to the terrace, independent kitchen. The housing features preinstallation of air conditioning by ducts.The price inclludes 2 underground parking places and a storage room.